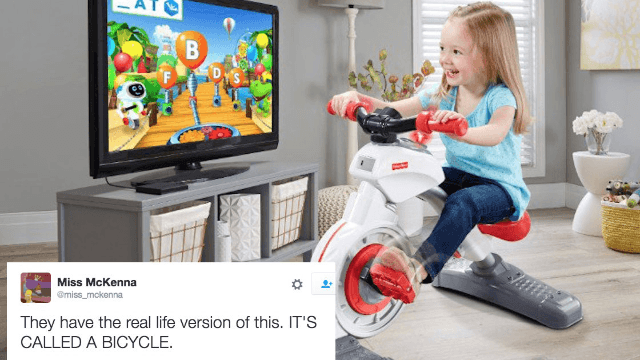 Fisher-Price made an exercise bike for toddlers and Twitter has opinions. Fisher-Price has previewed a stationary exercise bike for toddlers, because 2017 knows no bounds. And Twitter, reliably, has a lot of opinions. The Smart Cycle costs $149.99, comes with a tablet dock, connects to Apple/Android-TV and will be available in June 2017. "For parents looking to give toddlers guilt-free screen time, Fisher-Price has this high-tech exercise bike," they wrote. IMHO companies need to stop pushing the concept of "guilt" on consumers, let alone toddlers. And the thought of a generation of children peddling away like a miniature SoulCycle cult is kind of terrifying. That being said, I don't have kids and don't want to tell other people how to raise theirs. So I'll let Twitter do that for me. Some were confused about how to feel. Others had a dark outlook. or you could just limit TV time? How lazy is this country? But a few people defended the product, pointing out that not all kids have access to backyards or safe outdoor spaces. So, is this a sign of the apocalypse? Or a future generation of kids with unbelievable calf muscles? Both?